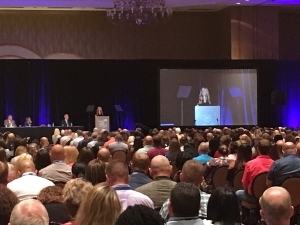 Dallas (WBAP/KLIF News) – More than 4,000 police detectives from departments across the country have started a week-long conference in Dallas on crimes against children. Dallas police and the Dallas Children’s Advocacy Center host the conference each year. Last year, the Center for Missing and Exploited Children received 8.2 million reports of human trafficking and children being sexually abused online. In 2017, the organization is receiving an average of 31,000 reports every day and is on pace for more than 11 million reports this year. “We want to bring folks from all over the world here to Dallas to learn best practices on how to investigate, treat, prosecute and how to support these children who have gone through these tragic incidents,” says Lynn Davis, the president and chief executive of Dallas Children’s Advocacy Center. Davis says the emergence of a global community has forced different agencies to work together to investigate cyber crime. Emily Vacher is the Trust and Safety Director at Facebook. She spoke at the conference, saying 93 percent of victims of online sexual exploitation report ongoing stress because they are worried pictures posted online may appear somewhere else. Vacher says sexual predators are adapting to different security policies, making the relationship between social media sites and police more important. Vacher says other social media companies are working more closely with law enforcement as well, but she says parents still take the lead role in protecting kids.